Effective Monday morning, August 6, 2018, Kingsport City Schools are back in session. The Kingsport Police Department will be patrolling Kingsport’s various school zones and actively enforcing traffic violations. Motorists are urged to slow down and drive with an increased level of situational awareness, especially around school zones. One relatively new state law that just went into effect midway through last school year prohibits talking on a hand-held cell phone while driving through a school zone. Things get a little crazy on the roads during the school year. Buses are everywhere, kids on bikes are hurrying to get to school before the bell rings, and anxious parents are trying to drop their kids off before work. It’s never more important for drivers to slow down and pay attention than when kids are present – especially before and after school. · Don’t double park; it blocks visibility for other children and vehicles. · Don’t load or unload children across the street from the school. · Carpool to reduce the number of vehicles at the school. · Have children exit the vehicle from the side of the vehicle facing the curb rather than the side of the vehicle facing traffic. · Use crosswalks. Don’t jaywalk or allow your children to do so. · Don’t block the crosswalk when stopped at a red light or waiting to make a turn, forcing pedestrians to go around you; this could put them in the path of moving traffic. · In a school zone when flashers are blinking, stop and yield to pedestrians crossing the crosswalk or intersection. · Always stop for a school patrol officer or crossing guard holding up a stop sign. 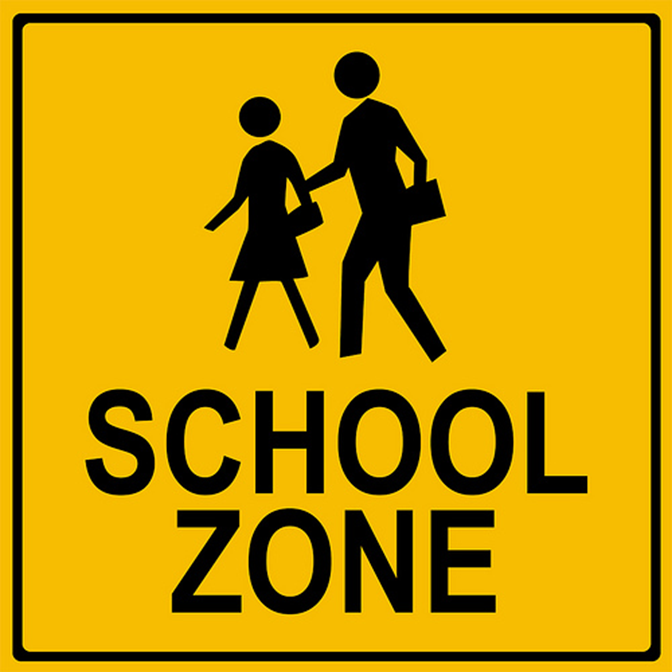 · Take extra care to look out for children in school zones, near playgrounds and parks, and in all residential areas. · Don’t honk or rev your engine to scare a pedestrian, even if you have the right of way. · Never pass a vehicle stopped for pedestrians. · Always use extreme caution to avoid striking pedestrians wherever they may be, no matter who has the right of way. · Never pass a bus from behind – or from either direction if you’re on an undivided road – if it is stopped to load or unload children. · If the yellow or red lights are flashing and the stop arm is extended, traffic must stop. · This is true even on multi-lane highways unless there is a barrier or grass or raised concrete median physically dividing the two directions of the highway. Multi-lane highways only divided by center turn lanes do not satisfy this criteria, so both directions must stop for a stopped school bus. · The area 10 feet around a school bus is the most dangerous for children; stop far enough back to allow them space to safely enter and exit the bus. · Be alert; children often are unpredictable, and they tend to ignore hazards and take risks. · When passing a bicyclist, proceed in the same direction slowly, and leave 3 feet between your car and the cyclist. · When turning left and a bicyclist is approaching in the opposite direction, wait for the rider to pass. · If you’re turning right and a bicyclists is approaching from behind on the right, let the rider go through the intersection first, and always use your turn signals. · Watch for bike riders turning in front of you without looking or signaling; children especially have a tendency to do this. · Be extra vigilant in school zones and residential neighborhoods. · Watch for bikes coming from driveways or behind parked cars. · Check side mirrors before opening your door. Finally, all motorists are strongly encouraged to make sure they, and everyone in their vehicle, are properly restrained. Being properly restrained by a seatbelt or an appropriate child passenger safety seat can easily make the difference in a motorist being seriously injured or killed in a crash versus walking away from the crash with minor injuries or no injuries whatsoever. By exercising a little extra care and caution, motorists, bicyclists, pedestrians, and school buses can co-exist safely in school zones and throughout the City of Kingsport.